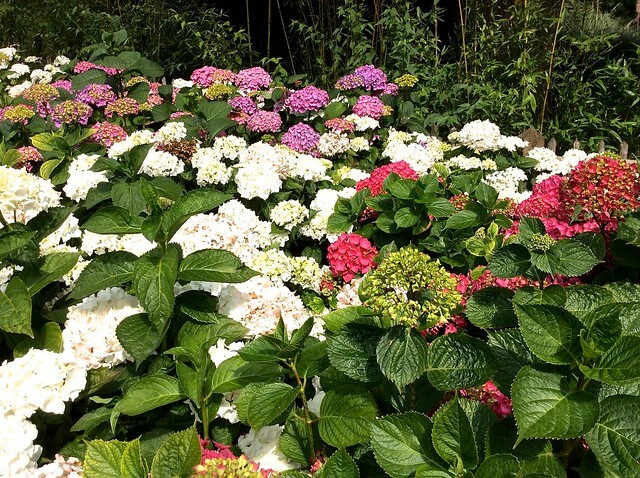 When I started this blog two years ago, the first actual event I wrote about was the opening of the Fukushima Garden in Holland Park on 24th July 2012. 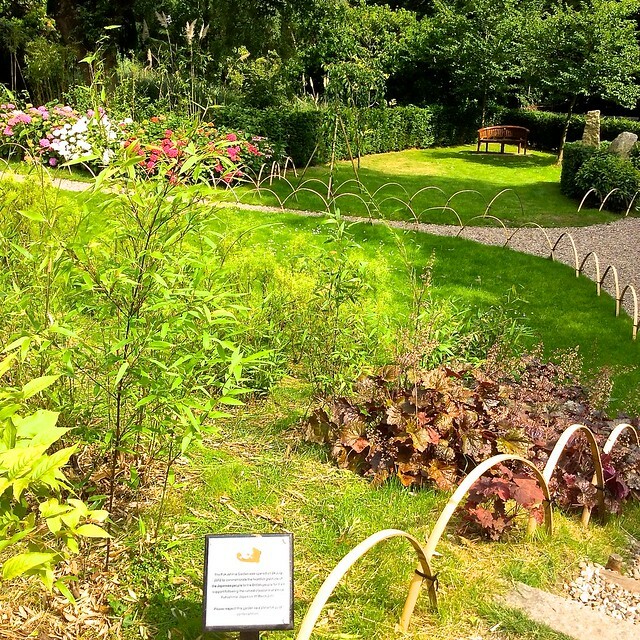 The garden was created as an expression of gratitude from Japan for the support British people had given following the tsunami in March 2011. It’s designed as a place for quiet contemplation, a peaceful contrast to the adjoining and better-known Kyoto Garden. The signboard on the entry gate has weathered now, but what else has changed? The dedication plaque looks almost the same, but has had an outline map of the garden added. 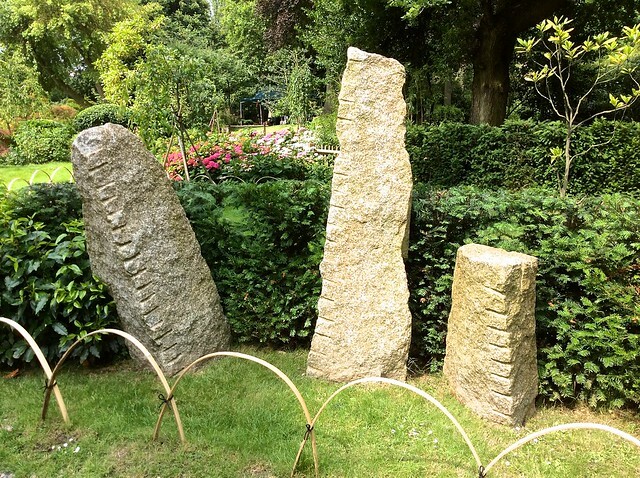 Just inside the entrance to the Fukushima Garden are these three ‘growing’ stones, symbolising the hope of renewal for Fukushima after the disasters. The plants behind them have grown into a substantial hedge. Like many Japanese gardens, the Fukushima garden represents a larger landscape with the pebbled paths taking the place of rivers, and a gentle slope representing the mountains. At the top of the hill is a new addition to the garden: a plaque commemorating the visit of the Emperor and Empress of Japan to the garden in May 2012, when they were in the UK to celebrate the Queen’s diamond jubilee. 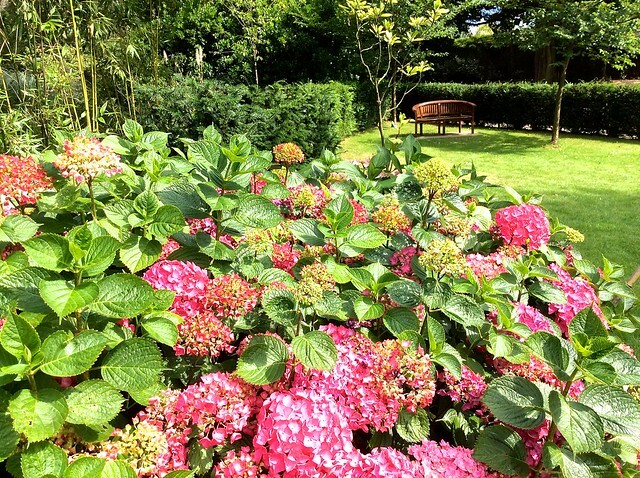 It was lovely to see how the hydrangeas that line the path have grown since the opening. 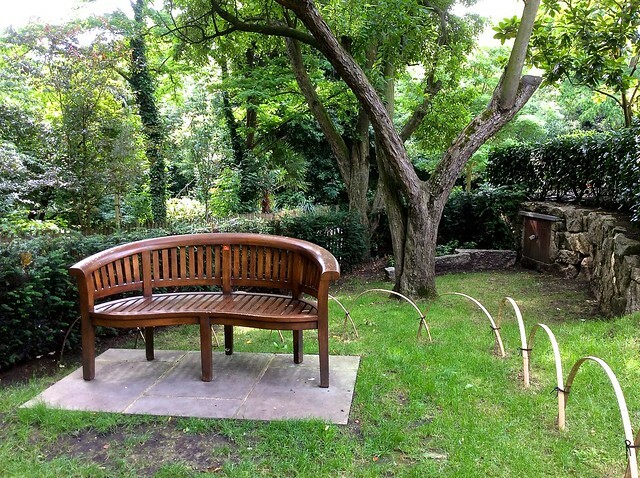 The benches, set in the shade of the trees at the bottom of the slope, are cool and inviting. 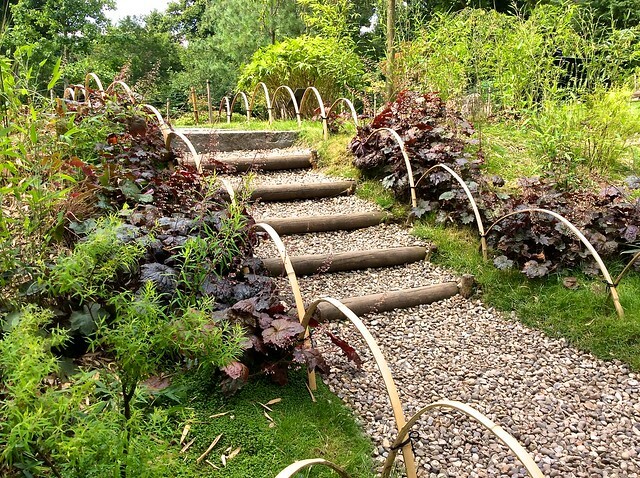 A little stairway leads up to the Kyoto Garden. At the top of the steps is this bench with a broken plinth, representing the Fukushima earthquake. And beyond are the more formal pleasures of the Kyoto Garden. Holland Park is in west London, nearest tube Holland Park on the Central line. It’s open daily from 7.30 am until 30 minutes before dusk. 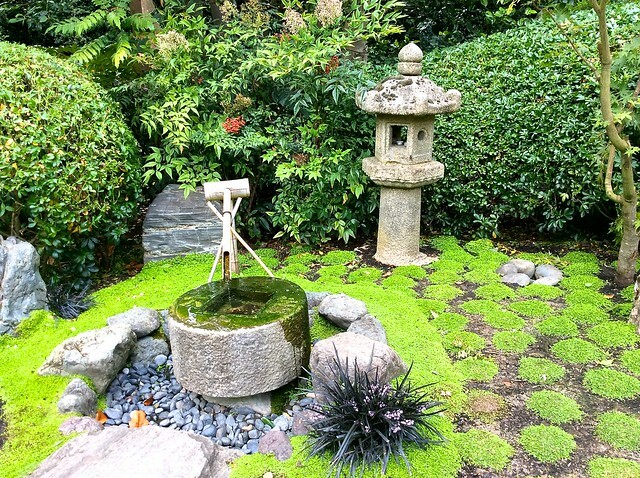 This entry was posted in Holland Park, Japanese Gardens and tagged Fukushima Garden, Holland Park, Kyoto Garden, London, nature, plants by Fran. Bookmark the permalink. Lovely photos of a garden I hadn’t realised was there! Thank you. The ‘broken plinth’ so simple, but really quite striking. The picture made me stop and think, and the effect must be even more visceral in reality. Yes, though it would help if they had something there to explain it. I only know because I went on a tour with Yannick. 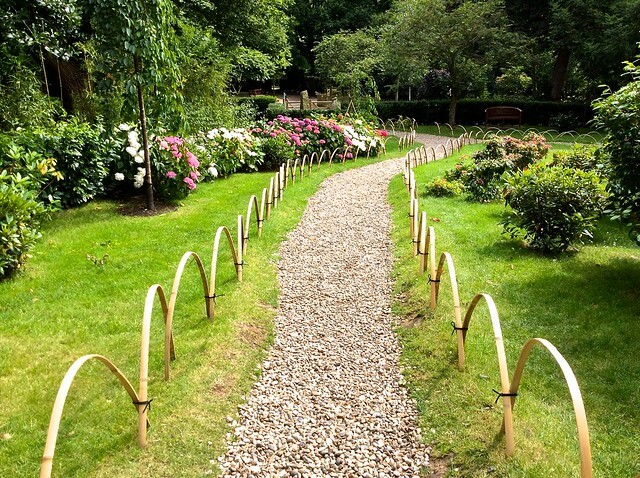 It’s interesting that they’ve used bamboo between the path and the no-entry (I’m assuming you’re not allowed to step into the garden) area. I’m not sure where you can find that in Tokyo. No, I’ve not seen it anywhere else. Hooped bamboo and string strung between bamboo are a request to not proceed further (eg onto grass). A solid bamboo rod across a path is an instruction not to proceed further. 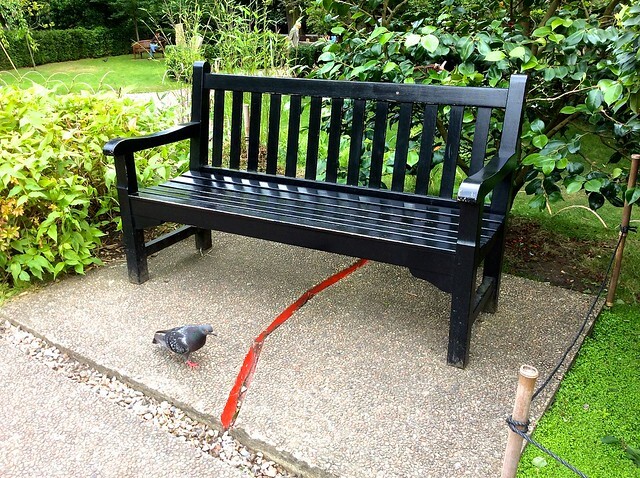 This convention is a fairly common feature and seen particularly around temple gardens. Accenting the crack in the plinth is classic Yasuo Kitayama and in the ‘wabi sabi’ tradition of celebrating or drawing attention to defects (perhaps most often in pottery). Thanks Barry. Good to hear from an expert!